Bad news, everyone who's been gripped by the saga of Alonso Watch 2014: he won't be buying Marussia after all. 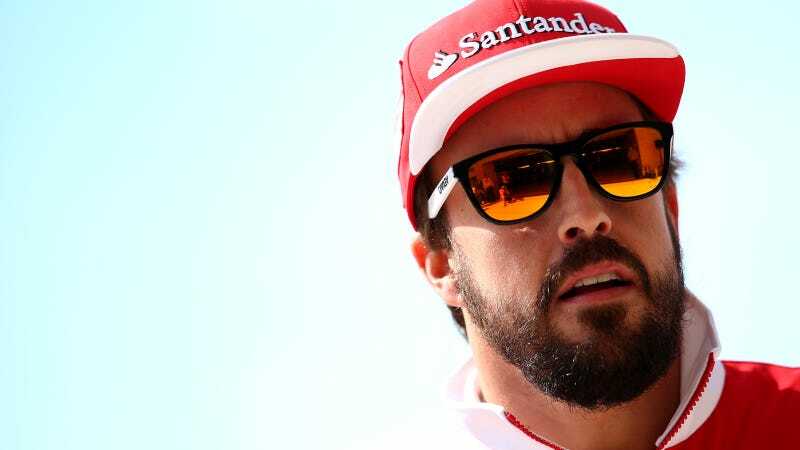 It's looking more and more likely that he'll end up at McLaren, with McLaren racing director Eric Boullier saying that he needs to make a decision on that before Abu Dhabi. Let me tell you, this Formula One silly season has crushed all of my hopes and dreams. McLaren's such a sedate choice when compared to all the other rumors out there. I mean, that bright blue-and-yellow Alonso Edition Ram 3500 Crew Cab would be the tow vehicle of my dreams, but all hopes of Alonso taking over Ram instead of driving in Formula One were DOA when Fiat Chrysler cut Ferrari loose. Fisher and Price will both be spinning in their graves now, knowing that the F1 superstar will likely choose spooty McLaren over professional Power Wheels racing. I don't think there is any deadline to do anything. One week it's McLaren saying something, last week it was Lotus and [Gerard] Lopez saying he was in talks about me and my future. That's true but it's not about Formula One, it's about another project we may have together, but it's on the business side and not F1. Every day is a rumour and even today I read that I had bought Marussia for one dollar. It's absolutely not true! It's the same thing always, but the most important thing, as I said in Japan, is that two or three months ago I took a decision and followed that decision and direction and hopefully you will know soon. Sorry Marussia, your new Spanish overlord will not be arriving. Ever. Alonso's comments to ESPN about next year seem to suggest some optimism in something like, ohhhhh...maybe a new Honda engine that might shake up the ranks. From the outside it's true that the situation is not so clear and probably Mercedes is the team that is dominating now and everyone thinks it will dominate next year. Probably we thought so also with Red Bull last year when they won the championship and the last nine races and this year they did five laps in winter testing. You never know year to year how things change and you need to study the projects, you need to see what are the prospects and you need to follow one direction. It's not the priority at the moment because we are racing here in a weekend with 75 people working on two cars to deliver a good result on Sunday and this is what it's all about. At the moment my priority in the past, the present and the future is Ferrari as well and it's not the moment to talk. Formula One is a complex sport and you never know how the teams will perform the year after. I think you need to see what are the best possibilities out there and I am extremely lucky and privileged to choose more or less where I want to go. I have the doors open in many places and we've seen the difficulty of some small teams, some drivers who are fighting for the seat even in this day. I feel very lucky not to have those problems and to more or less choose where I want to go. If I choose a direction some months ago it's because I feel it will be better, but it will never be 100%. And what'll ya know, it's McLaren who plans to try the Honda power unit first. Sorry, Marussia. Either Alonso's off to somewhere rather predictable, or maybe he's buying Caterham instead. That green and yellow livery looks really sharp, man.